Take a deep fresh breath with Apalus Purifying Bags! Enjoy pure and fresh air anytime you get back home. At the end of the day, leave the stress behind your door, feel comfortable and take a deep breath in your purified home! 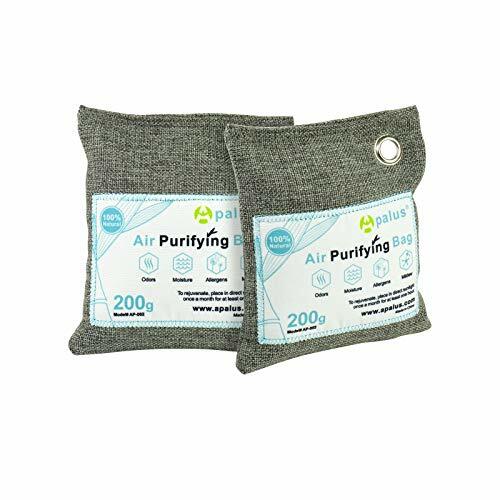 No more harmful pollutants, nor odors or mold will affect the air in your caring home with Apalus Purifying Bags! Apalus Purifying Bags, available in three different sizes, is pure and simple as you see it. It is filled with bamboo charcoal, no more than that. The Apalus Purifying Bags are made from bamboo charcoal, which naturally absorbs and filters out harmful pollutants and odors, with noticeable effects in just a few days. Also absorbs moisture, reducing mold and mildew and prevents bacteria proliferation in damp areas of our home. With Apalus Purifying Bags no need for batteries or electricity! The Purifying Bags work for you 24 hours a day, 7 days a week, to continuously keep your air fresh, dry and odor free. Avoid perfumes, sprays or other chemical substances that can be harmful to your family and your pets! But after this time, don't throw it away! Apalus bag is reusable! Cut open the Apalus Bag and use the bamboo charcoal as fertilizer for your plants! No residues left, no polluting waste in the environment! CARBON DEHUMIDIFIER ACTIVATE FOR HOME AND CAR. The APALUS Bag is an easy, convenient way to maintain a fresh, dry and odor free environment. FOR A MORE HEALTHY LIFE WITHOUT CHEMICALS. Fragrance Free, Chemical Free and Non-Toxic, the natural bamboo charcoal effectively absorbs and removes odors, allergens and harmful pollutants. ELIMINATE ODOR FOR FRID WITHOUT CHEMICAL SUBSTANCES- Prevents mold, mildew and bacteria from forming by absorbing excess moisture. CHOOSE NATURE WITH APALUS - Perfect in Cars, Closets, Bathrooms, Pet Areas. Covers 90 square feet. REGENERATE AND LONG LIFE. Reuse for up to two years. To rejuvenate and re-activate place the bags outside in the sun once a month for about an hour.